I think we all often forget to say “Thank You!” to the excellent service the Incoming QSL Bureaus provide. In my case I use the Ninth District QSL Bureau run by the Northern Illinois DX Association (link: http://qsl.nidxa.org/ ) and they are an excellent group. Thank you!! BTW your bureau is based on your call sign number. There are also various interest groups that have their own bureaus for their members’ use (OMISS and 3905cc come to mind). Again a thank you to the volunteers! When is the risk worth the reward of mounting a DXpedition to a rare entity? Over the last several years some amazing efforts have been made to activate places like Scarborough Reef (BS7H), Rockall Island (http://www.rockall.be MM0RAI/p and upcoming MS0INT http://www.eu189.com/) and other hazardous locals. These operations put radio amateurs and their support crews at considerable risk. Bluntly, they are not worth the level of risk being undertaken, much less are they worthwhile in an economic sense. One cannot think of any non-emergency radio QSO (contact) that is worth putting another radio amateur in danger, much less worth losing a life to make that QSO. These ultra-rugged DXpeditions certainly cross both those lines. It is one thing if duty takes a person to a risky remote dangerous location, and they happen to be able to work QSOs as a radio amateur. It is quite another to foolishly egg on our fellow hams to undertake these risks for purely hobby reasons. Every task we undertake a certain element of risk – even typing for this blog is riskier than some alternative activities and safer than some other possible activities. We quantify perceived risk with “common sense.” It is a temporary set-aside of that “common sense” that leads us to encourage DXpeitions with off-skew Risk vs. Reward benefits. Some fellow hams simply won’t work risk crazy DXpeditions, to distance themselves from the problem. Others use their checkbooks and sponsor only DXpeitions that are sensible. Some call for the award bodies (ARRL, CQ, IOTA and such…) to simply disallow any DXpedition that is high peril. I’m thinking as a community we need to do all three, and add a fourth item – get our “DX Drive” back in check. There is no place to work that someone else hasn’t already worked. They might not be hams, but a radio contact of some sort has happened before. DXing is often claimed to be a personal journey of self-challenge. Perhaps if we held that more important than encouraging high risk DXpeditions for personal vanity and brief peer recognition, we would be better off. The world of Amateur Radio is a very very big world. I was taken by a storge QSL card’s slogan “we are all very much alike” or something close to that, that showed from a recent eQSL logged contact. Amateur Radio has a lot to offer from the youngest to the eldest in the ranks. Whether QRP (very low power) or a Legal Limit QRO (high power) station, handheld VHF/UFH HT (handitalkie “pocket radio”), working CW (Continueous Wave – better known as Morse Code) or Phone (with a microphone), going digital (modes like PSK31 or Olivia), running RTTY (Radio Teletype), building an all homebrew station or running the latest SDR (Software Defined Radio) gear, it is a huge tent. 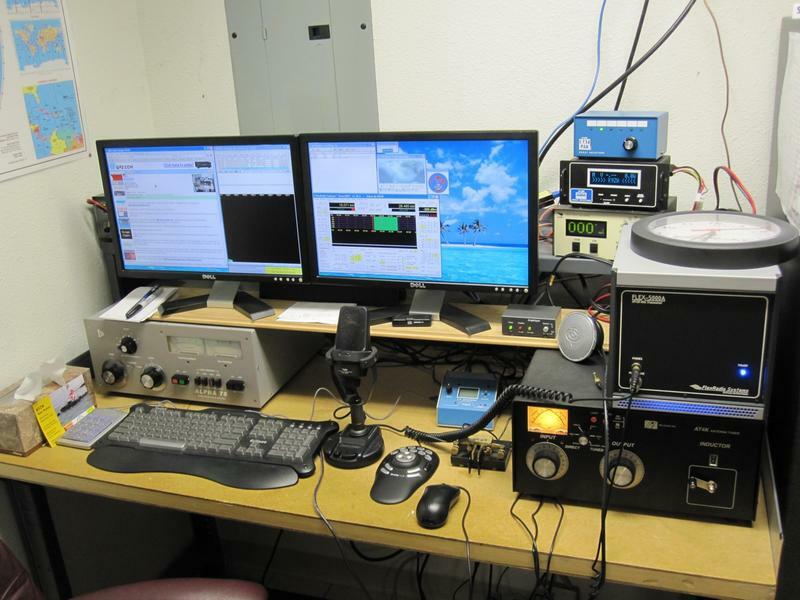 It is possible to get on the air on HF (High Frequency) for under $100 with used gear or perhaps Flight-Pig QRP kit and antenna, or spend a $100,000 putting together a showcase single operator station. A QSO (radio contcat) can be as fleeting as the exchange of a call sign and reception report, or as long winded as to run for hours. You can work without a microphone – more often than old timers will be running CW (Morse) or RTTY (Radio Teletype) to go microphone less, while the young are likely to be microphone free with a digital mode setup. Or you can run enough audio enhancement gear to sound like Wolfman Jack without the music. There are lots of pre-teens who are licensed every year. Piece of cake if they have a good head, an interest and a good coach (Elmer). And there are plenty of hams licensed in their 90’s & 100’s – some who have held a radio license since their youth! There are human mountain goats in amateur radio (think SOTA – Summits on the AIr – who operate from mountaintops) and explorers (think DXpeditions and ITOA – Islands on the Air – team members) who show off their mobility, agility, travel savvy, and hardiness operating from difficult places around the world. And there are those at the other end of the spectrum, those who overcome personal challenges to become radio amateurs despite handicaps, blindness, injury, or immobility. It is impossible to separate which of the two groups a person admires more – and soon I realize they all are to be admired having in each case risen above challenge to share communication dreams made real with fellow radio amateurs. It is a big tent hobby. Young, Old – whether in terms of age or in experience within the hobby – all have a place in the amateur radio hobby! With my present shack stacked on a single 30 inch wide assembly table, and boxed in by two big storage units, I’m struggling to find space to set up the Collins S-Line station. My station is tucked in the end of a room originally intended to be a wine cellar/storage area. A bit grandious of a feature for an otherwise normal walk-out ranch. 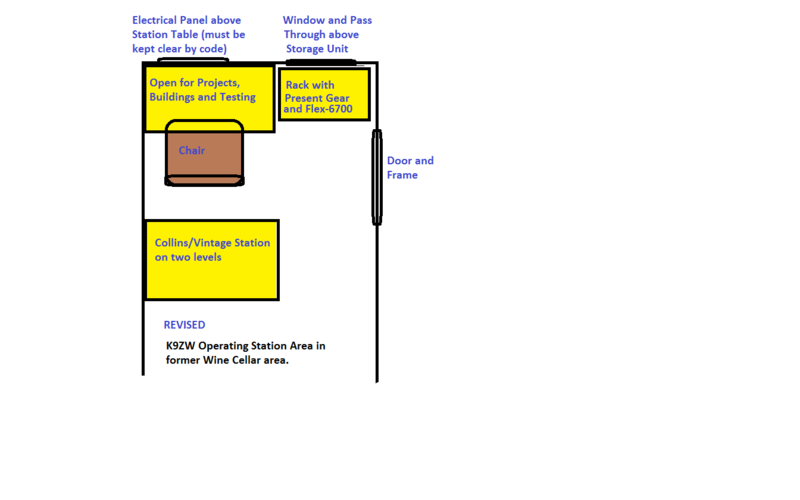 The area is confined by large storage units, the positions of the doors, windows and an electrical sub-panel that has to be kept clear of obstruction by fire code. 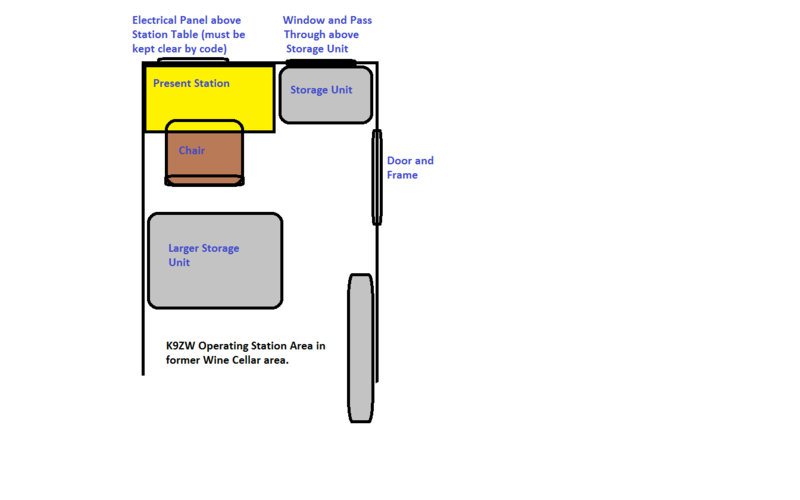 SO here is the direction I am heading – where the present gear (and a future Flex-6000 series radio) go into a rack where the smaller storage units was, and a two tier station goes heind me wher ethe larger storage unit was. Obviously I need some family cooperation to move the two storage units somewhere else in the house. Sensitive negotiations are underway ! First rule of ham forums (or any other internet forums): “The consensus of the uninformed does not give birth to an informed opinion.” Period. A forum can be a place of sharing, but only if the participants can & will bring information useful to share to that forum. A whole series of “I don’t know” forum posts doesn’t create knowledge. A whole series of negative to outright-troll posts never create a positive result. The first – the uninformed – only repeat the question, and the second – the forum troll – only gives voice to a bad spirit. So how to find quality information in forums? Fully Identified users – no Darko13 or other handles. Either by call sign or by full name every participant should be identified. Fully Identified moderators – ditto on the forum staff. If the mods hide behind handles there is a reason. Encouragement of both newbies and professionals– if the forum welcomes the new and goes out of its way to get opinions & posts from the expert, it is likely a better class of neighborhood. Strict “No Troll” and etiquette policies – a good forum shuts down trolls and has a heavy hand when it comes to personal respect issues. Big Tent rather than inner clique feel – some otherwise reasonable forums have been spoiled by inner clique issues, where the inner circle is held in higher esteem than other forum members. Minimal “Secret Rooms” – many forums have forum sections that are available only to certain classes of members. Sometimes you have to pay up, sometimes it is for volunteers, some private sections are for commercial reasons. These should be transparent and acknowledged. Moderation on the Monetization of the Forum – watch out for those that exist only to get advertising “clicks” or are only about making money for the forum owner. In the amateur radio world there are not that many large forums – QRZ.com and eHam come to mind the quickest. 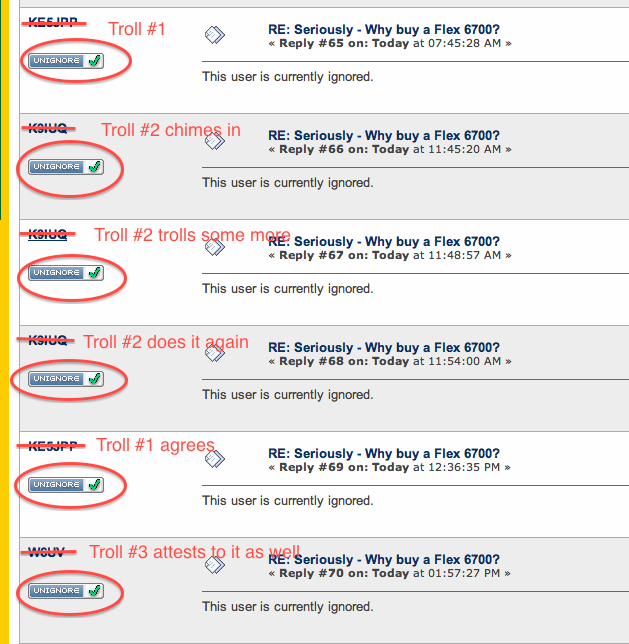 eHam is the amateur radio troll’s favorite, with many forum sections all but run by soured negative trolls. Moderation is all but absent and when it does occur uneven, summary, unexplained and anonymous. eHam has moderated my posts without explanation, reason or reply, completely erased hams from their posts, articles and reviews if they ask the eHam staff what is going on, and the staff never replies if you write them. eHam is about selling ad clicks, and if letting trolls pick fights with other amateurs gets more clicks – well that seems a-ok to eHam. If you want a look Google for eHam as I can’t recommend them by direct link. Then the ranks thin out dramatically. Perhaps a half-dozen open forums of various quality are the next tier. None are significant resources. The next tier, where you will find some quality forums, are the focus group forums. These are ones run by individuals, manufacturers, clubs and groups that have a specific point of interest – say ownership of an XYZ radio, or a shared interest in doing ABC radio operations, or other shared radio interest. Many are also hosted at Yahoo Groups. The wild west free for all of the UseNet IRC style forums is still out there, though it has been years since I spent any time wading in the flotsam and jetsam of UseNet. Too much noise to too little signal. Many of may wonder why forum at all, and perhaps that is where blogs like this come into play as a viable alternative? Sometimes Eagle’s Wings – The Saga of Aeropostale by Joy Dunkerley includes accounts of early corporate radio and radio navigation. When the Almond Tree Blossoms by David Aikman touches on radio use when the world comes apart. Shut Down and Buck: A Survivor of the Shut Down both by W.R. Flynn include important Ham Radio operators when the world isn’t being held together by much. Frozen in Time: Murder at the Bottom of the World (Antarctic Murders Trilogy #1) by Theodore Jerome Cohen (the Author is a radio ham himself) includes the work of radiomen. Founders: A Novel of the Coming Collapse and Survivors: A Novel of the Coming Collapse both by James Wesley Rawles mostly includes radio amateur’s operations in the background. The Road Home by Andrew Baze features Amateur Radio as a centerpiece. Three Hundred Zeroes: Lessons Of The Heart On The Appalachian Trail by Dennis R. Blanchard K1YPP includes some accounts of his operating. What have you recently read that featured Amateur Radio where you might not have expected it?